The oldest amusement park in the world has been providing a nice spot to have some fun since the 1500s. Everybody knows Tivoli Gardens, the famous Copenhagen amusement park that purportedly served as a model for Disneyland. But Dyrehavsbakken, or Bakken as it is generally known, located just north of the Danish capital, is the original and far more interesting park. 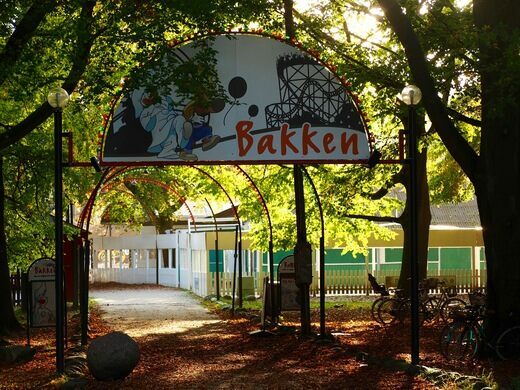 Dyrehavsbakken (“The Animal Park’s Hill”) is the world’s oldest amusement park. It opened in 1583 and has since undergone a number of transformations. The location first became an attraction thanks to the freshwater spring located on the grounds. Bakken was a gathering place for those seeking clean water and beautiful scenery. Then, in 1669, King Frederick III closed the grounds to the public and began using them as the private royal hunting grounds. This remained the case until the park was re-opened in 1756 by King Frederick V.
After the re-opening, performers, vendors, and rides began to make their way to the park, creating the Bakken we know today. The modern Bakken amusement park is wonderful, but beyond the park is where the real excitement lies. The old royal hunting grounds are still full of wild deer, beautiful trees, and some of the only hills in Denmark. For a real treat, go in the late fall when all the vendors are gone. The ever-trusting Danish leave the gates wide open and a visitor can wander through the abandoned amusement park (beware, the gray skies may heighten your fear of the giant clown signs) before trekking through the crisp fall forest, searching for bucks and abandoned wooden structures. Only open from April to August. Behold the rickety wooden glory of the world's oldest operating roller coaster.